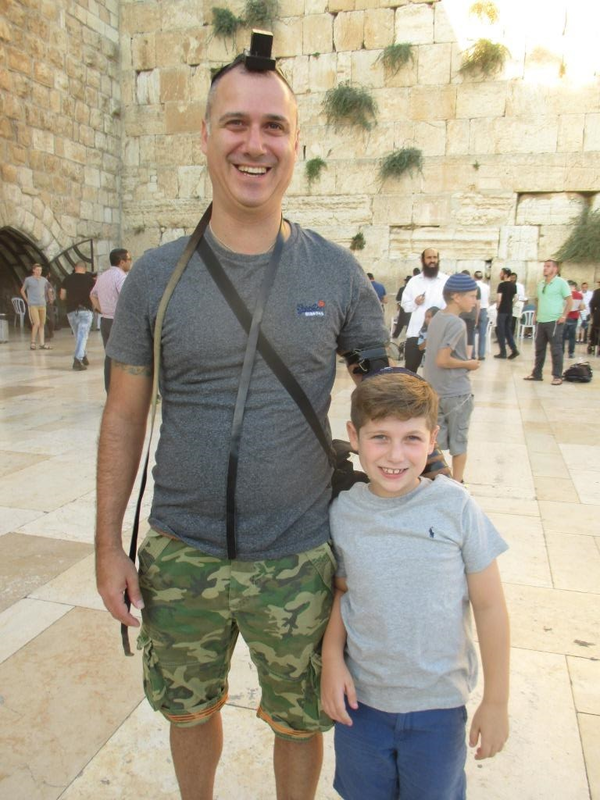 He was visiting Israel from London with his wife, two daughters and his son. He is forty-three years old and had never put on tefillin. He was very nice, and the boy was as sweet a seven-year old as I have ever met. I told the boy that when he grows up to remember what the "old man at the Kotel" told him. He has to marry a Jewish girl. The father happily followed the instructions. He prayed for his loved ones, took a lot of pictures, had a great time. "Your father is a wonderful person, and you should listen to whatever he tells you to do. You should try to be as good a person as he is. But he made a mistake and you should not follow your father in this one thing." I rubbed my finger over one of the tattoos and told the boy, "Don't put any tattoos on your body. It is not good. So, you be like your father in everything except for this." The boy seemed to understand, and the father smiled. They walked away having had quite an experience at the Kotel. So here is the question, what should I have done? Obviously, the easiest thing would have been to ignore the tattoos and just give them the best tefillin experience I could. But then, what about that lovely Jewish boy? Should I have ignored the obvious risk of him following his loving father's mistake? If ever there is a doubt in such cases, I think "If I was that little boy, what would I want?" and I try my best to get the message across without offending the father. Seems like I got away with it this time. We all come with our own thoughts; understanding; experiences and our understanding of the law. As usual, you did the right thing. Me? I would have ignored the tattoos, yet you went one step further and it's fine. You were not met with ridicule or disgust and , as a result, you have showed others, that if not done nicely, a person can influence another well. Reb Gutman: You did exactly the right and proper thing by bringing this up to the little boy and said it perfectly, that even his father understood and appreciated your input. Think he himself is sorry that he ever had them put on (he can take them off one day-not easy, but sure it is doable). How else will the Jewish people, who are so, so uninformed of Jewish law, customs and especially Torah itself, learn and, hopefully, be brought back to Yiddishkeit? Jews learning and teaching in the ways of Hashem is probably one of the greatest mitzvahs.